If you have noticed that the spiders at your property are actually increasing in numbers, then you can easily take care of the situation by calling PEST XTERMINATORS. Book a reliable spider control London service for your home and you can be sure that you won’t see an eight-legged around your place for a very long time. There are a few types of spiders that are common in houses and other man-made structures. They invade homes in search for shelter and prey. It's very easy to determine if spiders are present at a certain property, you just have to look for the webs they weave. Usually, they are irregularly shaped and can be spotted in various corners of the property. A single spider can weave numerous webs at different places in search for the optimal preying spot. And of course, chances are you will notice the spider crawling around. The webs are more of a nuisance than the actual spiders. However, house spiders can become aggressive towards humans if threatened. Generally, they like to keep their distance. Usually, their bites don't require medical attention but a person might experience an allergic reaction. If so, seek medical attention immediately and bring the spider along for proper identification. An experienced pest controller will visit your property when it's comfortable for you. He will carefully examine the place to determine the level of spider infestation. Then he will get to work. 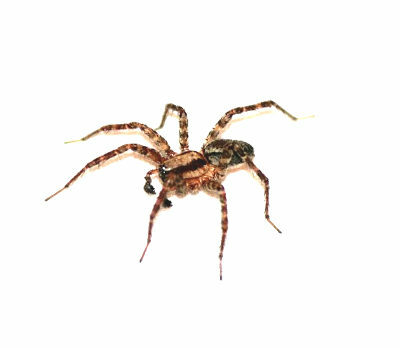 Your pest controller will diligently apply a special spray on the affected areas that will knock-down all spiders that roam freely around your place. Your property will be protected from future infestations as the anti-spider solution has a three-month long residual effect. At the end of your spider extermination service, the pest controller will gladly share with you some useful prevention tips against further spider infestations. If you have any pet animals at home, including fish, take them away for a few days. Hoover/clean all affected areas as best as possible. When your pest controller arrives, leave the property so he can apply the pesticide. House Spiders are a few kinds of house spiders and none of them are dangerous. They usually manage to infiltrate properties through small gaps around windows and doors. Then they will find a suitable spot to situate their web in hope that some unlucky insect will fall in their trap. Spiders are not insects themselves – they are arachnids and have eight legs. We started spotting giant house spiders around the shed and the garage, which just seemed to happen more and more often over time. We hired professionals who said it’s unusual to see them as much so far from fall and it indicated an infestation around the property. The expert spent a good two hours in search of the source and I was quite impatient about seeing a spider’s nest in my own home. The treatment and general expertise were reassuring and needed at a time like this.